Yesterday Apple held a media event to announce its latest iPod products, and I proudly wore my iPod Engineering shirt in celebration. I don't usually care too much about media events, but this one was exciting for me because Steve Jobs announced a product that I worked on during my internship this summer: the new iPod Nano. It's exciting to see the launch of a product that I worked on, and it's pretty satisfying to have played a part in making a well known product that everyone likes. When I was traveling in Europe this summer, every time I saw an iPod, or an iPod ad, I thought, "I'm part of the team that made that. Even all the way over here on the other side of the world, they love the products that my team in California made." One of the downsides of working at Apple is that the company is ridiculously fanatical about secrecy, both inside and outside of the company. When friends asked about what I worked on, all I could say was "iPods". When they asked what the new iPods were like, all I could say was "they're cool". When friends asked when they were coming out, all I could say was "in the future". Well, now you can see the coolness, and the future finally came. I'm beginning to feel the same way! 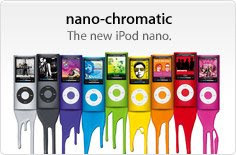 It was nice to talk about the new iPod touches that were released along with the Nanos. I take it you accepted a fulltime job on the iPod team? How does the size of the Nano compare to the size of previous generations of Nanos? The larger screen makes the whole device look significantly larger than previous Nanos. Mike: yep. I'll be back in January. Jacob: the new Nano is almost exactly the same size as the first and second generation ones, except slightly thinner. There is a slide in Steve's keynote video that shows all of the Nanos lined up. iFixit has pictures that show all four Nanos lined up. You know, it doesn't really look thinner at its thickest point. Perhaps Steve was thinking about the average thickness, or the top/bottom profile area, or maybe the overall volume of the iPod. It is thinner (at its thickest point), by 0.02 inches. Bruce, you've almost convinced me to buy an iPod.